Make MP3 to iPhone M4R ringtone, iPad ringtone on Mac. Ideally make your personalized ringtones from various audio and video for iPhone/iPhone 3/iPhone 4/ iPhone 5/iPhone 6/iPod touch 4/iPad 2/the new iPad/iPad 4/iPad mini with 3herosoft iPhone Ringtone Maker for Mac. It can easily converted audio/video files to M4R audio that can be compatible with iPhone, iPad and iPod touch 4. This smart iPhone Ringtone Maker can be capable with powerful video converting functions, you can make ringtones for iPhone/iPod touch/iPad from almost all video and audio formats (including AVI, MPEG, WMV, DivX, MP4, FLV, H.264/AVC, MKV, RM, MOV, MP3, WMA, WAV, RA, M4A, AAC, AC3, and OGG.). Next big hit will be its excellent iPhone ringtones management. You can easily transfer the converted M4R audio files into iPad/iPhone/iPod touch directly without iTunes' help. Besides this, specific ringtone making will be allowed, add fade-in and fade-out effect for iPhone ringtone, adjust the ringtone volume and pre-listen the previous files or the converted audio files. Even you can manage all iPhone ringtones to satisfy your need in a separated window. iPhone Ringtone Maker for Mac fully supports iPhone 3, iPhone 4, iPhone 5, iPhone 5S/5C, iPhone 6/6 Plus, iPod touch, iPad 2, the new iPad, iPad 4, iPad mini. Convert any popular audio format such as WMA, WAV, RA, M4A, AAC, AC3, OGG and MP3 to M4R, and make it your iPhone ringtone for iPhone, iPod touch and iPad 2.
iPhone, iPod touch and iPad have the 30 seconds or 40 seconds ringtone length limitation. 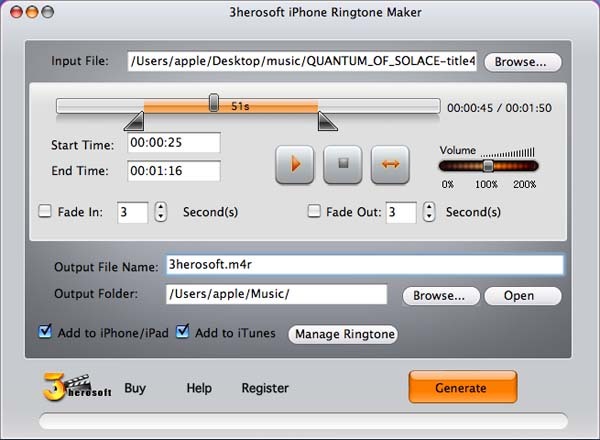 3herosoft iPhone Ringtone Maker for Mac can make and transfer iPhone, iPod touch and iPad ringtone longer than 40 seconds. 3herosoft iPhone Ringtone Maker for Mac allows you manage ringtones in iPhone, iPod touch and iPad directly, such as renaming, deleting, exporting to Mac, exporting to iTunes, etc. Convert MP3 to iPhone M4R ringtones files, transfer them into iPhone/iPad/iPod touch 4?